Recently, I was lucky enough to be given a case of POM 100% Pomegranate Juice by POM Wonderful. They're hosting a recipe contest for bloggers that began on October 20th, and they wanted to give me the opportunity to try cooking with the juice a little. 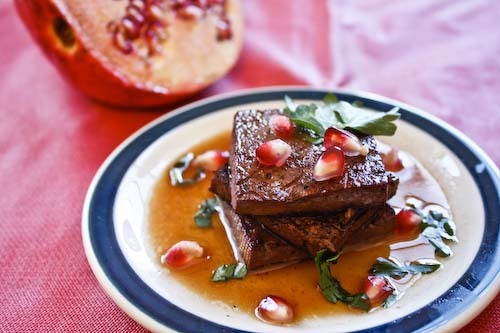 I've had my eye on this Pomegranate Braised Tofu recipe from the amazing Pace Web of Taste of Pace. Pace and I actually went to college together briefly before she transferred away, but we recently reconnected over our mutual love of, what else, food! Pace developed this recipe for The Green Girls TV, but you can watch her make it right on her own blog which is linked above. What's so great about this recipe is 1) it uses tofu and I flippin' love tofu, especially the crispy-on-the-outside kind. 2) It's way easy and does not necessitate a ton of ingredients. 3) It's damn tasty. Of course, don't forget that technique is the basis of this recipe: marinating, pan searing and braising. And that's something you can do with other flavor elements as well. I made only small adjustments to Pace's recipe: I added a tablespoon of pomegranate molasses to the marinade and I garnished with fresh pomegranate seeds for some extra color and a little crunch to go with the tofu. If it's pomegranate season, I would highly recommend adding some seeds, they provide such a fresh delicious pop which contrasts perfectly with the incredibly savory sauce. Halve your brick of tofu into two long bricks, then slice each into 1/4" rectangular pieces. 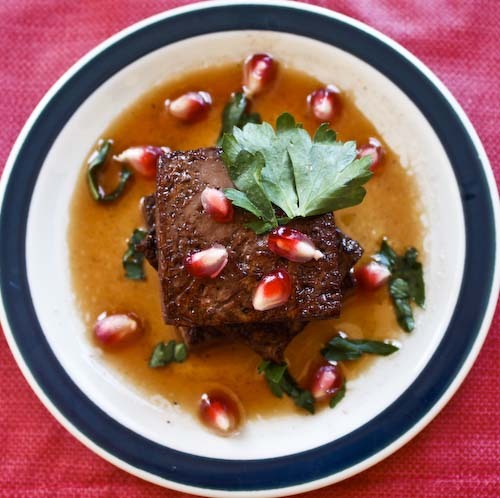 Fill an oven-proof dish with the pomegranate juice, soy sauce and the crush garlic (whisk in the pomegranate molasses if using). Arrange the tofu pieces in the pomegranate marinade. Allow to marinate in the refrigerator for 1 hour. Once the tofu is marinated, remove the slices from the dish, reserving the liquid. Heat the tablespoon of oil over medium-high heat in a frying pan. Once the oil is hot enough to shimmer, brown the tofu pieces on each side until golden. Make sure your oil is hot enough, the tofu should sizzle when it hits the pan. Once the tofu slices are browned, return them to the marinade, which now becomes the braising liquid, and cover the dish. In an oven preheated to 350, cook the tofu for about 30 minutes. That's pretty much it! Once the tofu comes out of the oven, you can plate it and garnish it with fresh pomegranate seeds, a bit of green cilantro or chives and a spoonful of the braising liquid on top. OMG, yum! I love tofu and am always looking for ways to make it tasty. And pomegranates are the best way to garnish - tasty and beautiful with just the right crunch. Your photos are gorgeous. I am defenitely going to try this recipe. I make orange tofu with orange marmalade, garlic and soy sauce. I think POM will be a nice variation to that. Your tofu looks gorgeous! Dana, thanks, I love using pom seeds as garnish! They're like little bursts of flavor! Veggie Belly, that orange tofu sounds amazing! Is it on your blog? I'm going to check. If it's not, you should totally put it up! Gorgeous photos, Andrea! I love your food styling techniques. Pomegranate is so photogenic too. Nice work on this posting! This looks really delicious. 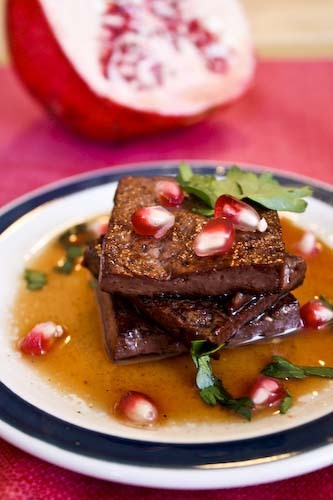 I love pomegranate in any way, and tofu is a really creative way of serving it. Brava, dahling! Well done! The fresh pom seeds are such a lovely touch. WOW. That's all I can say. Very original and looks good! getting the seeds out of the pom drives me NUTS, but I will admit this looks fantastic! Thanks for the comment, Angela! I agree about pom seeds, they always look like little jewels. Anonymous and Miss Marie, thanks for coming by! I haven't used pom much, but I think I'll start including it more. Hi Pace, thanks for the great recipe! I fully plan on trying more off of your blog! Alexander, yes, getting the seeds out is a pain, but you don't need many. Although they do tend to shoot out all over the place! Such beautiful photos... This seems like a really nice way to enjoy my favorite edible block of whiteness.